We have seen many multitasking tweaks that try to redesign the app switcher while adding some other features to it. Auxo 3 is the most popular example. Today another multitasking tweak for iOS was released in Cydia that aims to make the app switcher experience on iPhone and iPod touch better. The feature packed tweak seems quite well designed and offers functionality that makes us wonder if this is the multitasking tweak that we didn’t know we needed so badly. 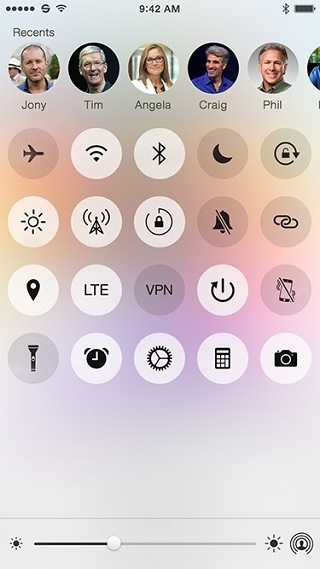 Just like Auxo 3 it combines the functions of Control Center and app switcher. Alympus offers a unique yet familiar app switching experience. It offers multiple layouts for the app switcher screen each of which can be selected by performing a pinch to zoom gesture. The first layout is the normal app card layout that you can swipe left or right on. Then if you pinch on the screen you will see a new layout that displays 4 app cards on a single page. 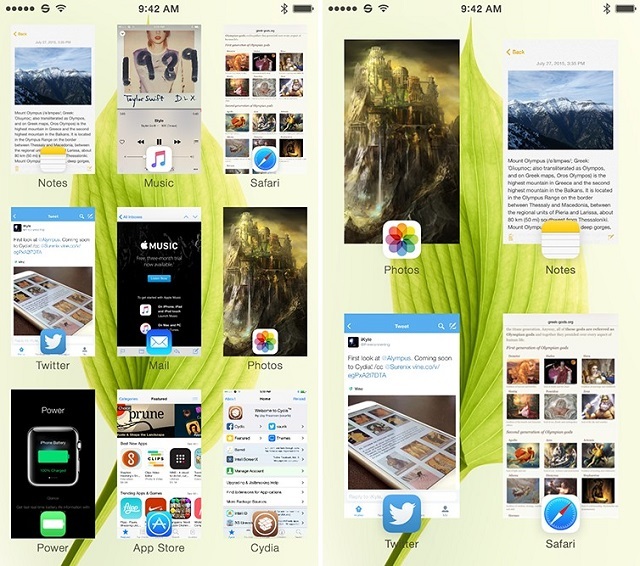 When you pinch even further the tweak will display 9 app cards on one screen. You can swipe to access more apps and quit them by swiping up. Alympus remembers the last layout you had to give you a uniform experience. Perhaps the most interesting and the last app switcher layout Alympus offers displays all the running apps in an icon form, just like the homescreen. This allows the tweak to show a bunch of apps on a single page. Now that we are done discussing the app switching part of the tweak lets talk about additional features it has to offer. You can swipe right to access the music controls. Unlike most other tweaks of its type Alympus shows a complete now playing screen that has all the controls you need for your now playing music. 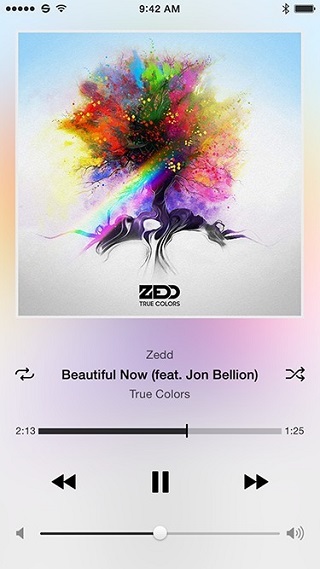 You can also launch the stock Music app by double tapping the album artwork. It also lets you switch between dark and light modes when you triple tap on the album art. You can swipe even further to access the toggle screen of Alympus. This screen gives you access to a wide range of setting toggles, which you can rearrange on the fly. It also displays slider for brightness at the bottom and your favorite contacts at the top. Alympus multitasking screen can be accessed by the default double press of the home button. You can also swipe up from bottom right side of the screen to get to the app switcher. 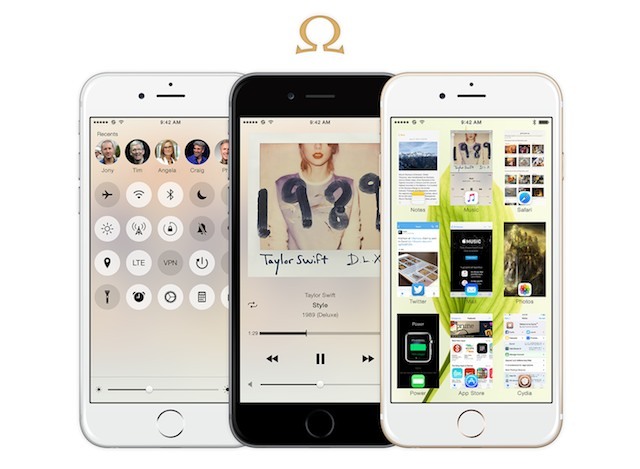 Alympus tweak for iOS 8 and iOS 7 is available at a price of $3.99. It works on all models of iPhone and iPod touch whereas iPad is not supported yet.